2) Our call to spread that good news. 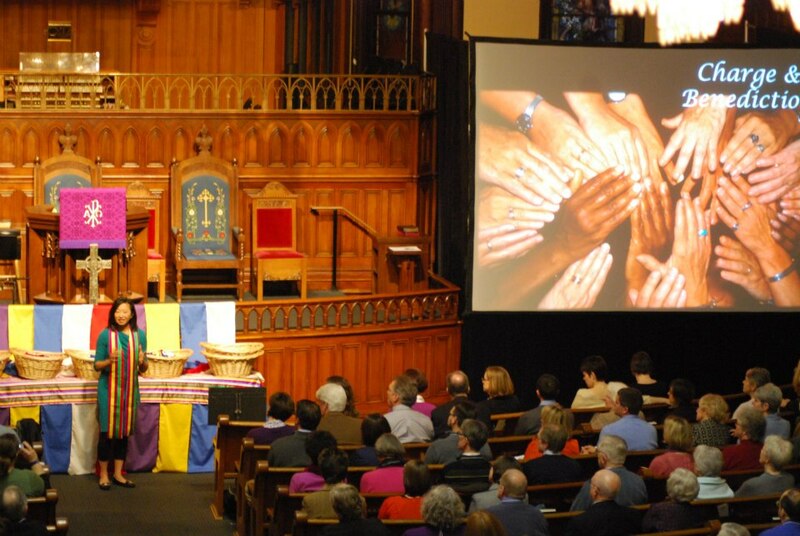 At the 2013 National Gathering, we will focus on what is born from the Spirit. We will lift up the magnitude of the message over the chaotic culture moment and the disappointments of our institutions. We will reclaim our calls to ministry even as those calls evolve. We will celebrate what the Spirit has done and is doing so that we can be open to what the Spirit will do. We have to be born again. Through four worship services, we journeyed through the eyes of Nicodemus through the seasons of Advent, Baptism of the Lord, Lent, and Pentecost. 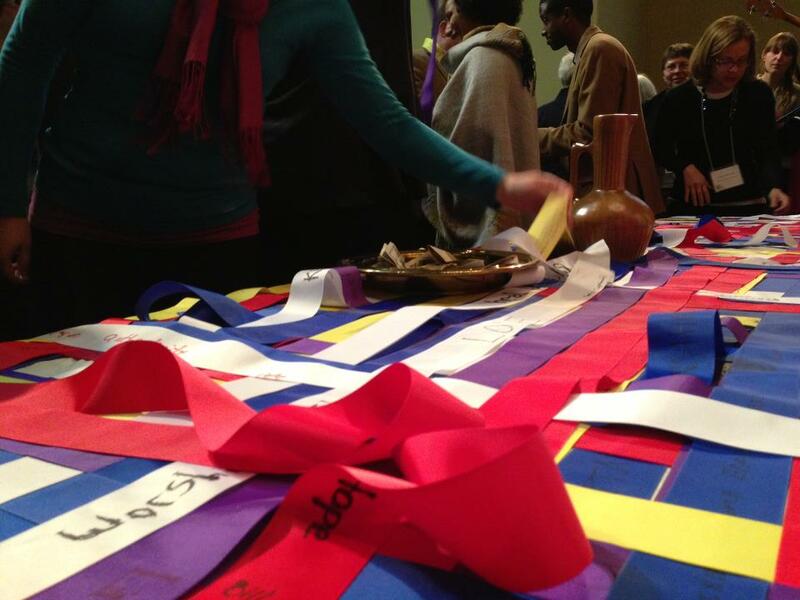 Using only fabric, ribbons, and sharpies, we linked the worship services together through rituals and reflections. The focus of this worship service was not on the actual birth of Christ, but on the preparation that was needed for Mary and Joseph to be ready for an uncertain journey. We may prepare ourselves for ministry and church by reading all the books, having all the technology, gathering all the resources, but the question is “how does one prepare oneself for a journey when the outcome is unknown?” Like Mary and Joseph, all we needed was to be prepared to say “yes” to trust God, knowing that God has always been faithful. The focus of this service was remembering our baptismal identity as a child of God. As we venture out on this unknown journey, we can be affirmed that we belong to God. This worship service focused on Jesus’ call to ministry. Now that we have prepared ourselves for new birth and claimed our baptismal identity, what is our individual and collective call? 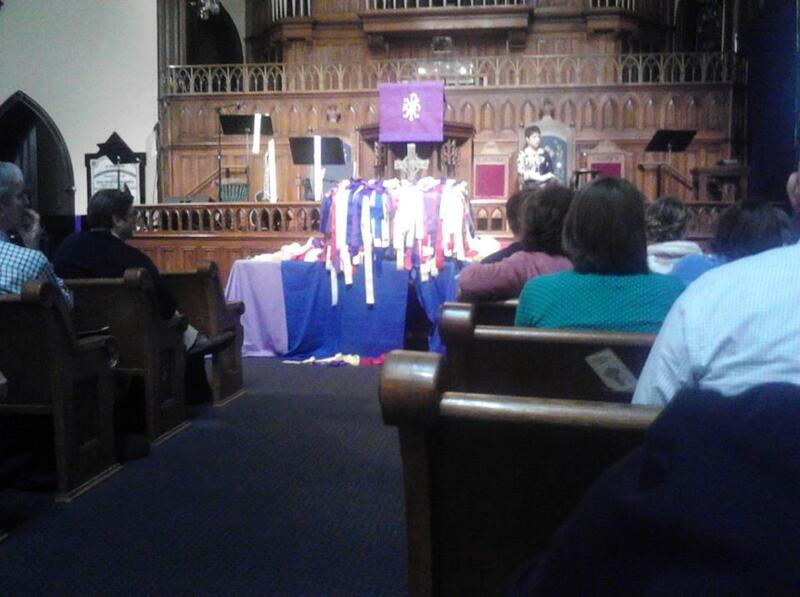 In the worship service, the colors of the ribbon chosen were explained. 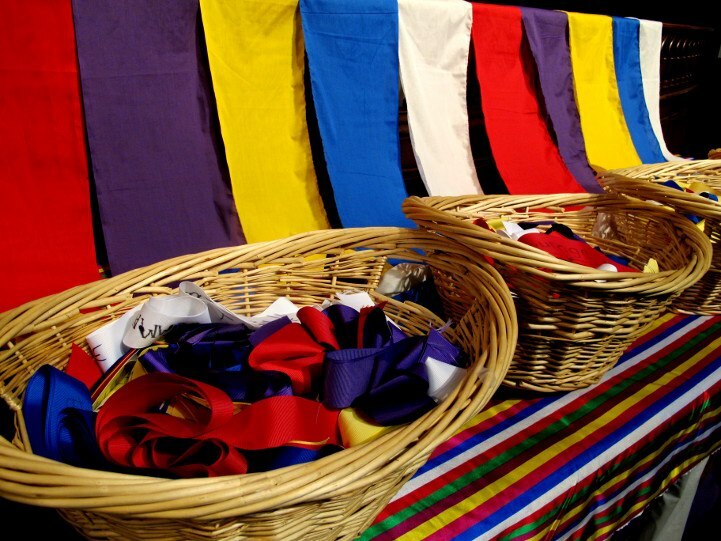 Purple, blue, red, white, and yellow are typical colors of a Korean fabric called saekdong. Saekdong is often in children’s clothing and protects children so that they can evoke their dreams. Individually, we see one solid color, but when we look around, we see all the colors of the saekdong. We see the collective hopes and dreams of all for where God is leading us next. 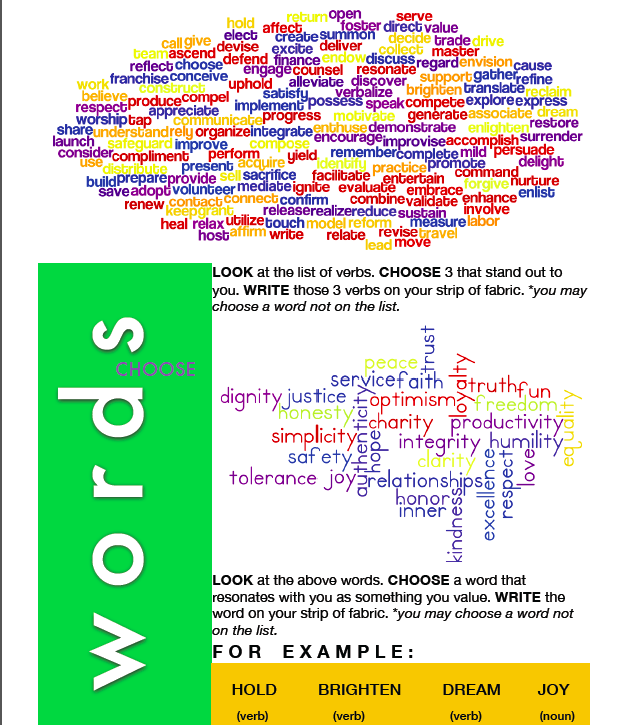 Worshippers were asked to bring their ribbon with their words written on it. They paired up and shared the words on their ribbon, completing the sentence: “My call is to (verb), (verb), (verb) (noun). Then, briefly explain off the top of their head how that sentence resonates with them. Handing their ribbon to their partner, that person would say, “Your call is to (verb), (verb), (verb) (noun)” and put it around their neck as a stole. 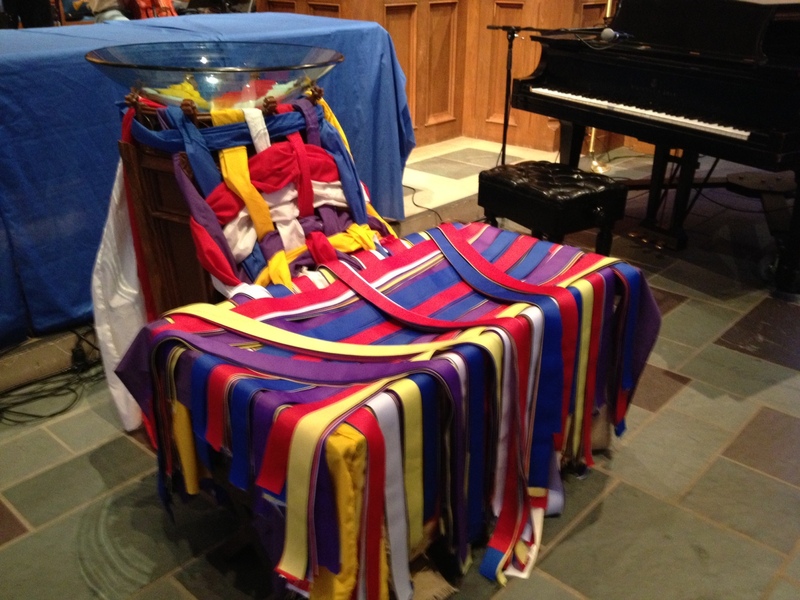 Later in the service, the stoles were placed in offering baskets as a symbol of us offering our calls to God in response to God’s faithfulness. This worship service focused on the spirit of Pentecost and how when the spirit blows, it is amazing what God can do. As we are born again, we open ourselves to the power of the Holy Spirit to lead us to places we can only imagine. 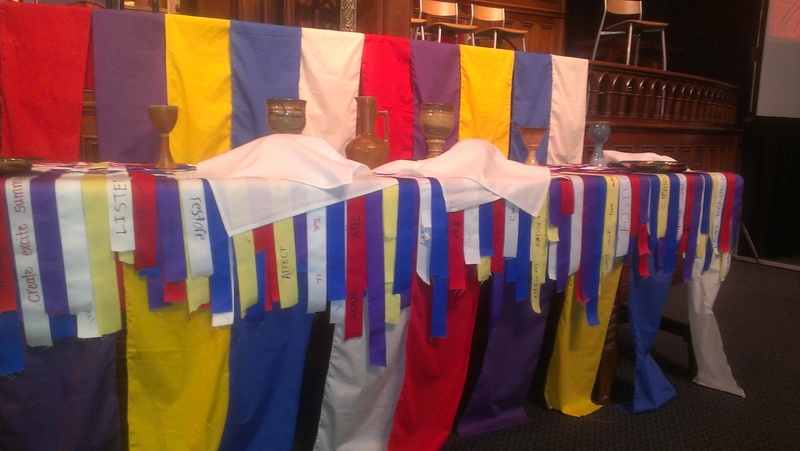 The ribbons/stoles were woven on the communion table, symbolizing how our individual calls are collectively woven together. At this service, all the worshippers were invited to be the celebrant at the communion table. Collectively, we said the Words of Institution. Collectively we said, “When you eat of this bread and drink from this cup, you do so remembering me.” As people came up for communion, they were to take someone else’s ribbon and take it home with them so that they can pray for that person. Who knew there were so many ways to use and refashion ribbon! 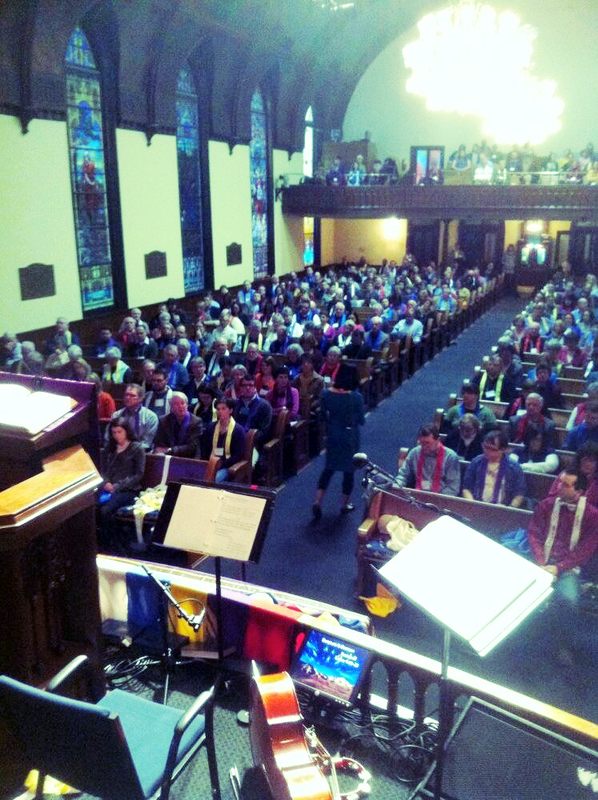 It was wonderful to be able to link all four worship services together with a common theme. Theresa – you challenge and inspire me! Thanks for your service to the church universal! Wow! Awesome and way cool!